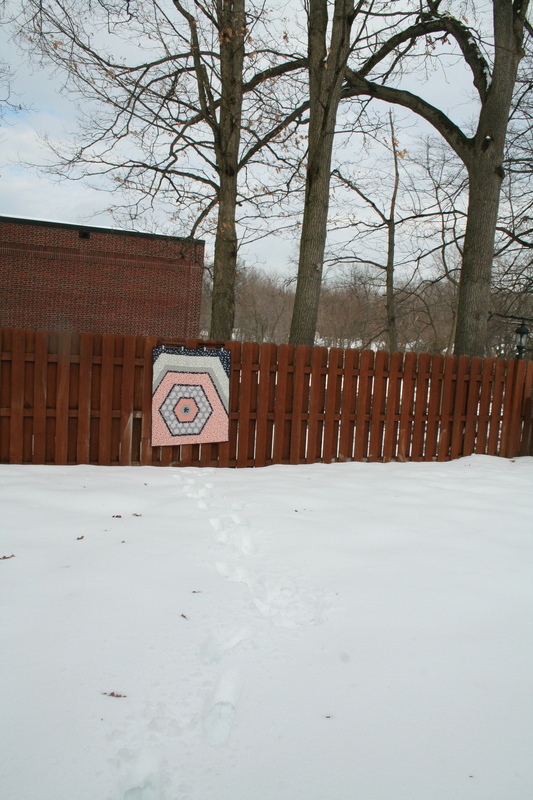 Contest and giveaway – name my fence! 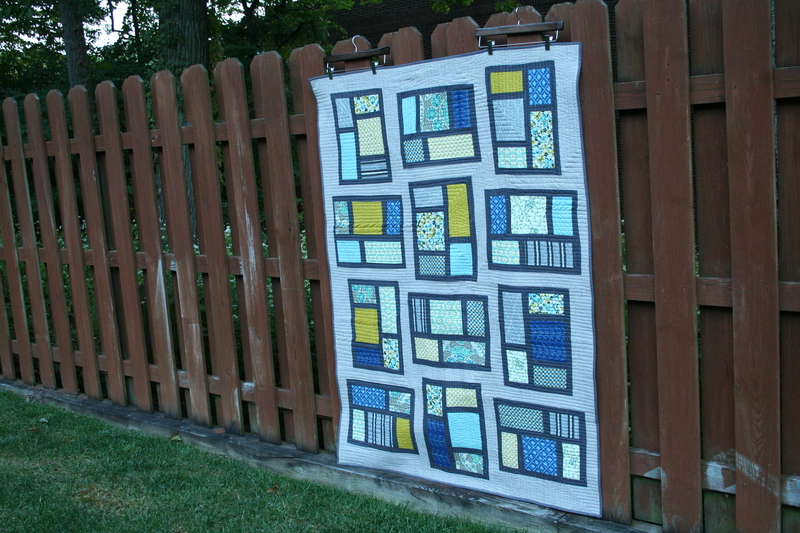 Have you noticed that most of my finished quilt photos are taken on the same background? It’s mostly out of necessity– during the hours that have good light for quilt pics I don’t usually have an assistant who’s more than four feet tall. I actually stole the idea from Cath to use hangers with clips instead of waiting for an adult to volunteer and get bossed around. 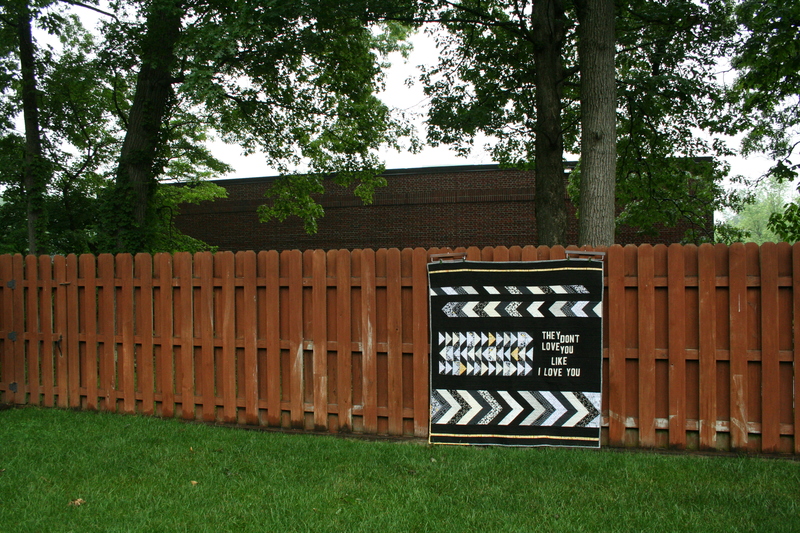 Meet my fence. It’s a nice fence. Fence is an odd word, isn’t it? Fence fence fence. Fence holds the quilts straight and Fence is nice and tall. Fence is a shade of orangey brown that I sometimes wish was a little more neutral. Despite that, I love Fence for being a wonderful photo assistant– he/she isn’t mouthy or demanding. Fence works for free. Fence gets lovely light. 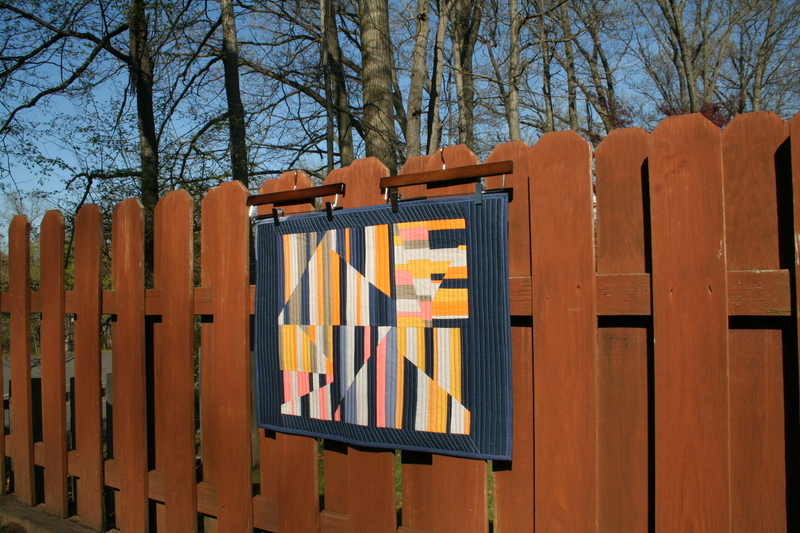 Here’s the thing: I’ve decided that Fence needs a name. I owe him/her that much. But I don’t know what to name him/her. Here’s a little insight into my strange brain. I like to name things– my first car was named Wally. Others have been Wallina, Stealth and Monty. I’ve had a gerbil named Cappy, a teddy bear named Autumn, a dog named Gonzo and two children, Eli and Miles. Our wifi network is BeepBoop. Sometimes I name people I don’t know, like Blanket Lady (shockingly that’s not me) and Library Loretta. But this one is stumping me. I need help. I’ve also been looking for a good excuse for a giveaway. Will you help me name my fence? 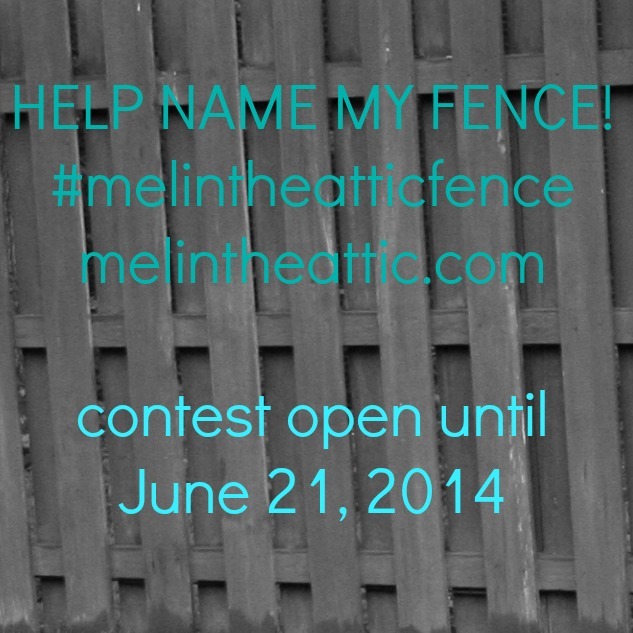 Leave a comment on this post or on Instagram (I’m @melintheattic) with the hashtag #melintheatticfence. I’ll pick a winner on June 21. 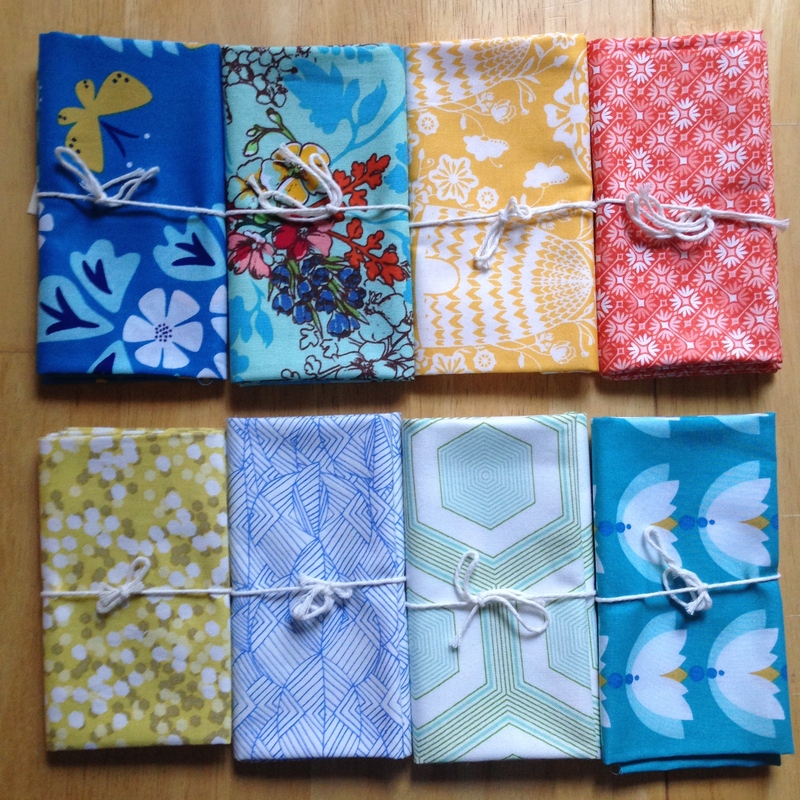 I have one set of four fat quarters for my favorite name and one for an entry that I’ll pick at random. I’ll give the winner first dibs and maybe throw in a few other goodies. I had too much fun picking out these summery lovelies at Rock Paper Scissors. Thanks for the help. Now have fun, be creative, and get naming! The only car I’ve named was the old beater ’78 Chevy Blazer–I named it Dirt Bag. I didn’t want to give it a proper name since it wasn’t my car (my parent’s). Our wireless network is Blue Sun (evil corporation from the Firefly series) and all of my computers and peripheral devices have been named after planets from Firefly (Miranda, Persephone, Ariel, Haven…). We’ve had cats named Princess and Stitch and dogs named Frodo (Waggins) and Samwise (Doggee). And a snail named Slurms MacKenzie. We also had a rolly polly named Zoidberg, which turned out to have babies, so we called it Mama Zoidberg. Anywho, I like the name Francine for a fence. Oh, I know your fence’s name!! Your hard working, reliable fence’s name is “Woody”!! Thank you! !… This was fun! I also name things and I talk to them and,”funny” coincidence, my actual car is called Wally! As for your loyal assistant, I would simply call her Fanny. My car’s name is Scout, and my first car’s name was Atticus. I think you should name your fence Fiona. Between me and my husband, we have quite a few odd names: our cat is John Edensir Littlewood, Woody for short. His old dog was Randalus Maximus the third, car is Sylvia, sewing machine is Johann (it’s a Viking afterall), all the computers are named though surprisingly our WiFi is not. Hmmm, that’s a glaring oversight. 😀 But, onto the fence naming. Hmmm, its difficult, though the color reminds me of a cappuccino, and its a large fence, so how about Venti? Sophie (my 7 year old) and I like Puddin’. Mother’s Little Helper (MLH). Or Mother’s Enormous Helper (MEH). I’m going to go with Fagin. He was a fence. I think you should name your fence Cherish because it stands the test of time. It enduring. Isn’t it obvious?? His name is Spencer. And since you two spend so much quality quilty time together, you’d be on friendly enough terms to call him Spence the Fence. Digger. It sounds like the kind of name a fence would have. And my oldest son is named Eli so obviously I have good taste also!